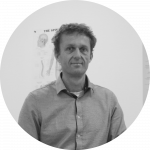 Nico Ruiter, together with Ingrid Vel, is the founder of Fysiotherapie Vennewater. Nico is a physiotherapist, sports physiotherapist (I.A.S.) and N.V.F.S, manual therapist (SAMT) and orthomolecular nutritionist (member of MBOG.AOV-Bonusan). Nico also holds an NLP master certificate (NTI-NLP), obtained the certificate from FMS instructor (Functional Movement System) and received the FIFA Football Medicine diploma in 2018. Nico completed the osteopathy course at the IAO in June 2015. Bringing movement and relaxation into harmony with the aim of experiencing well-being is the basis of his actions. He treats athletes at national and international level, and was present at the Athletics Championships Apeldoorn, the Olympic Games 2012 in London and the European Athletics Championships in Zurich.